Kovana Flareona Simbala, or Kovu for short, is commonly called a 'sun-fire panther'. Her body type is that of a black panther. She has red-orange fur, a dark red mane or mo-hawk, green eyes and a red birthmark over her left eye. There is also a red flame on the end of her tail much like a tuft of fur. She can control if the flame gives off heat or light. She is actually a creature from the race known as the Kerin. A magical race that come in many different forms and have supernatural or magical powers that relate to one element. Kovu's element is the sun. She can summon flames and flares from the sun as well as a few other spells; although, her other spells are not as strong and can leave her feeling tired. She does not do well with ice at all as it weakens her. Kovu is rather serious and known for her anger. She is always there for her family and friends though. She will attack anyone who threaten them. Kovu like fire, the sun, heat, her family, friends, Drago and piece and quite. She hates lots of noise and ice. Ice weakens her. Kovana Flareons Simbala was born to Mufasa and Flareona. She is a Kerin which is a race of magical creatures that can each control a different type of element. One Kerin will look completely different from the Next. Mufasa looks like a large anthro lion with wings and con control wind, while Flareona was a Phoenix fox who control fire. Kovu looks like a red orange panther and can control solar energy and minor fire control as well. When she was only 5 years old her mother suddenly died in a plague that swept through the Kerin. The anger and rage that Kovu felt when her mother died burned across the kingdom and burned up the plague. Being a long lived race it wasn't until Kovu was 123 before Mufasa married again. It wasn't long before Kovu had a little brother, who was named Kayposa. His element was the mind, a first among the Kerin. Kayposa mother though thought that he was the downfall of the world and tried to kill the boy. Kovu had to kill her in order to say her brother. Even though Kayposa was only 2 he remembers every detail of what happened and to this day says he is in his sister's debt. It wasn't till she was 320 before her father found another he fell in love with. This time he married a shape-shifter named Terra. Soon she had a new sister and brother; twins. They were named Carrie and Shinra. 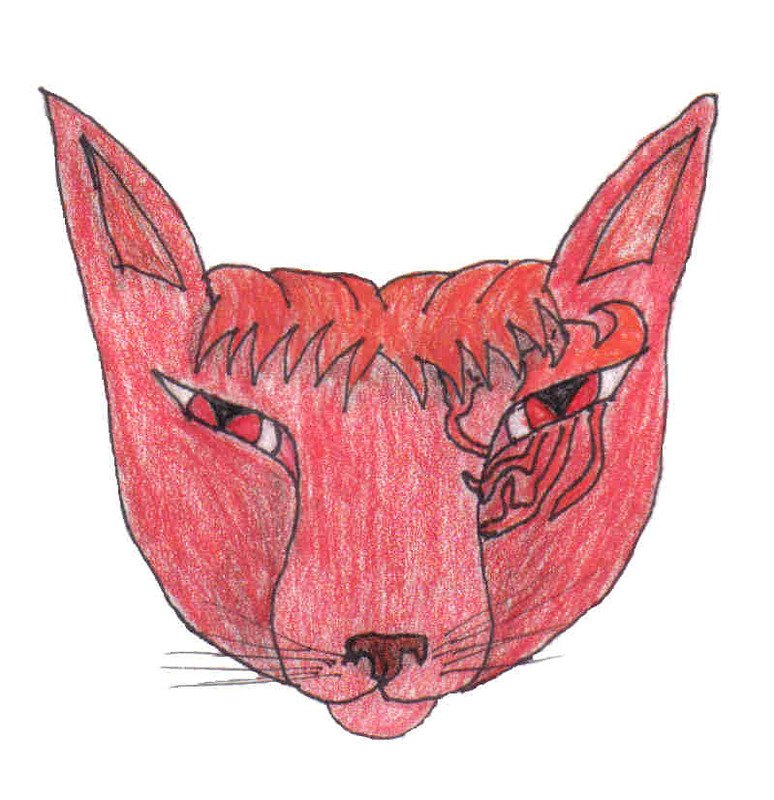 Kovu comes from an unnamed world filled with magic and many other creatures of legend. Her body type is that of a black panther. She has red-orange fur, a dark red mane or mo-hawk, green eyes and a red birthmark over her left eye. There is also a red flame on the end of her tail much like a tuft of fur. She can control if the flame gives off heat or light. The Phoenix pendant that was her mother's. Here is one of the first pictures I did for Kovu. Her eyes are green now.